Flatheads love big live bait. 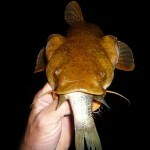 Catching catfish with live bait is a fabulous way to put big catfish on the bank. Live bait works great with all species of catfish but knowing how to fish live bait is essential if you want to catch big flathead catfish. There are some classic obstacles to fishing live bait: You must know the local laws, you have to catch the bait, keep the bait alive, rig the bait correctly in order keep the bait from tangling or snagging. Each state has its own laws about using live bait. Many states ban the use of certain species as live bait. 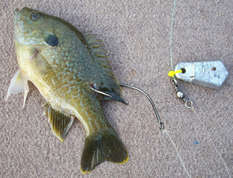 Often game fish are not allowed to be used as bait. Live bait is often banned from certain bodies of waters as well. Transporting live bait can also present some legal issues. Live bait becomes an invasive species when they escape off the hook or are dumped into the water after fishing is over. Live bait can also introduce diseases and parasites as well. Many states have laws regarding the transportation of certain live fish and then putting them in the water. With all the problems caused by evasive species and diseases, governments take these laws very seriously and we should take it seriously too. Try to avoid using live bait that is not from the area where you are fishing. 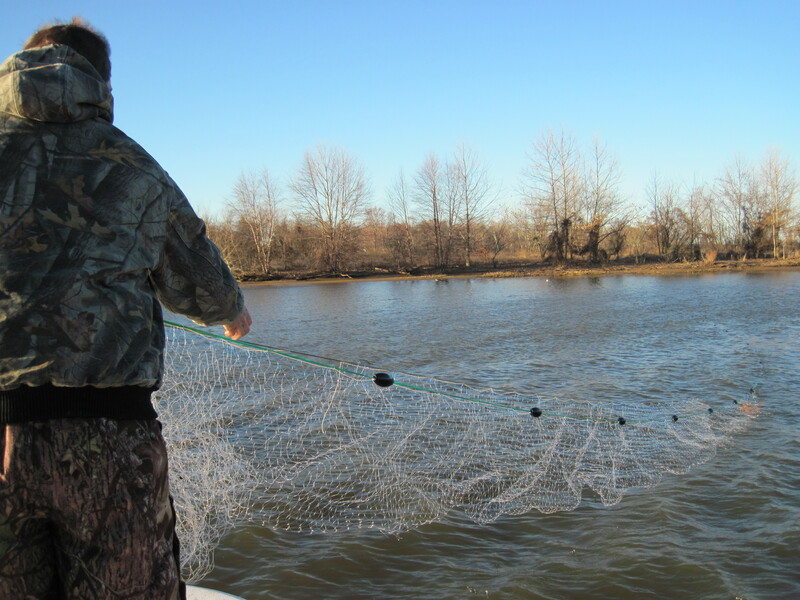 Gill nets are great for catching a lot of shad or herring. Catching live bait is a real challenge. You have to catch you bait before you catch a fish. Always have a plan “B” when planning to catch live bait. 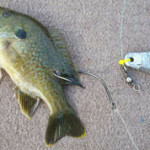 Rod and reel is the most reliable way to catch blue gill, sunfish, bullheads and sucker. A bobber, split shot, some small hook and some worms or maggots does the job quick and easy. A casting net is a great way to catch shad, skip jack, herring and chub that don’t readily bit and hook and line but you can also catch anything else that swim. 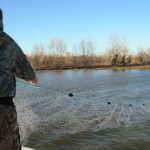 Casting nets are extra equipment and they take a bit of practice to learn how to use but you can catch a large volume of bait very quickly when things go well. However, casting nets don’t work when there are snags on the bottom. Additionally casting nets have limited range and many states outlaw or seriously limit their use in freshwater. Set nets, gill nets, and sine nets work really well for herring, shad, minnows and small bait fish. However, the laws are even stricter on these. Using these also requires equipment and skill. The advantage is the sheer volume of bait you can catch. Minnow traps and crayfish traps are cheap and easy to set up. You can even make your own out of 2 liter pop bottles. Minnow traps are great for catching small minnows, eels, cray fish and crabs that can fit a 1” diameter hole. The down side to minnow traps is that they typically have to be set well in advance of the actual fishing and you can only catch small bait. Not only do you obviously want your live bait to stay alive, you also want it to be lively. The wiggling and thrashing is what attracts the fish. Keeping fish alive and lively requires oxygen and cool temperatures. You can have insulated bait coolers with oxygen pumps, live wells, or bait buckets that you keep in the water. For boat owners with live wells you can buy chemicals to add to the live well water to keep the bait lively. Whatever you do, keep the bait in the shade, keep it cool, and keep the water oxygenated. You want to rig live bait in a way to avoids tangles with your own line and to keep the bait from getting snagged. When using a float I like to hook the fishing through the back just behind the dorsal fin to avoid getting wrapped in the line. Floats and bobbers are great for keeping your bait from swimming under logs or diving under a rock. However, floats allow the bait to swim or drift and is hard to keep in the spot you want. When fishing with a bottom rig, I like to hook the fish through the tail to encourage them to try to swim upward which will prevent tangles and diving under rocks. However you decide to hook the fish, make sure you have a lot of hook point exposed. Here are some great videos demonstrating how to catch bait fish.